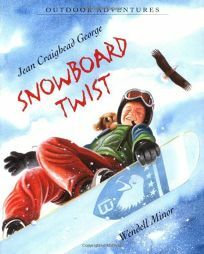 Third in her Outdoor Adventures series, Snowboard Twist by Jean Craighead George, illus. by Wendell Minor, finds Axel, his father and his friend/rival, Kelly, exploring the new-fallen snow of the Tetons, testing it for safety. When Kelly is nearly caught in an avalanche, it's Axel's heroic dog, Grits, to the rescue. .